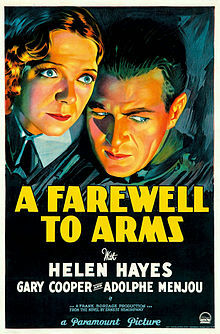 At the end of last week's episode, David and Suzan were sure that A Farewell to Arms, which stars Gary Cooper and Helen Hayes, had to be a good movie. Suzan expected that nothing with these two stars could possibly be bad, and David, for whatever reason, didn't expect it to be so "Hemingway-y." Boy, were they wrong all around. Not that you'd expect a WWI movie to be a bundle of laughs, but this one's a real bummer.